I completely misidentified the Type-90 Kyū-maru in the Rebuild pic. No, it's still not the Leopard 2A7/A10 the creators said it was. What they actually are are Challenger 2s. 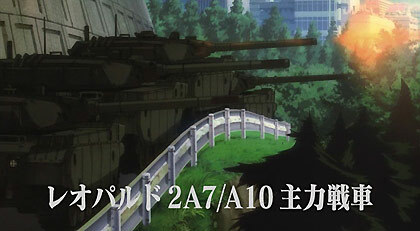 The picture showing the tanks in question, pay special attention to the turret shape. Can't remember my log-in information for the wiki, so I'm throwing this out there for the people who do. As to the tank - yes, the tank turret and even whatever is there of the hull seems to be shaped like the Challenger 2, although the gun shape seems a bit off (and the gun looks to be mounted a bit higher than it should). The more I look between images, the more I find it some kind of...crazy hybrid. Not a Leopard 2, now that you point it out, but this sort of "fictional future modification" doesn't help identification any. Have the Evangelion: Chronicle relationship charts for NGE/NME "Rebuild"/Puchi Eva been posted anywhere on the wiki? A few threads here and there mention some of the relationships (such as Puchi Eva and "Rebuild") but I really think it'd be worthwhile to have readily available since character relationships are important to understanding certain aspects of Eva. For instance, apparently the French edition of Chronicle mentions Kaworu has feelings of sympathy/teammate towards Rei in the NGE relationship chart. At last, after my blunder back in October in replacing the mentions to "Rebuild of Evangelion" by "Evangelion New Theatrical Version" instead of "Evangelion New Theatrical Edition", I finally mustered the courage to change it again and put the proper name! Don't hesitate to remark if you see a "Evangelion New Theatrical Version" or a random "Rebuild of Evangelion" that I could have missed! ... Well except the "Rebuild of Evangelion" page, which I don't know how to change nor make the redirections. On a side note, it seems that the consensus in the forum is to treat Rei Q as a different entity than Rei Ayanami, and while we know too little of her to warrant her her own character page, I was wondering how are we supposed to refer to her on the wiki page? Evangelion Mark.09 is an Eva unit appearing in Evangelion 3.0: You Can (Not) Redo and piloted by a clone of Rei Ayanami. It is affiliated with Nerv and Seele. So far, so good, but on the page listing all the Evas appearing in NGE and Rebuild, we have in the case for the pilot "Rei Q/Automated". Wasn't there some decision awhile back to not change the wiki's "Rebuild of Evangelion"* naming scheme because that screws up Google searches and something inside the system? Or was that only about the forums/main ("news") page? *"Rebuild of Evangelion" is what the making of features are called, but the films overall are "Evangelion Shin Gekijoban" (New Theatrical Version/New Movie Edition etc etc). ElMariachi: For 3.0 Rei, I think something along the lines of "Tentative Rei" is good; we don't want to use fan names since it just causes confusion when official names already exist. I think we had left it at that, yes. So, do I have to change all the ""Evangelion New Theatrical Edition" back to "Rebuild of Evangelion"? And I vote for using "Rei "Tentative" to refer to Rei Q, "Tentative Rei" can give the feeling that she's an object to be replaced, while the movie hammers the fact that she's her own individual and not a soulless shell. Rei "Tentative" is a bit flaky and it's difficult to change to that when "Rei Q" has been an established shorthand for her. (Even Shinji is "tentative, subject BM-03"). Keep Rei Q as it is. It helps that her plugsuit has "09" ("Kyu" in Japanese) and she pilots the Mark.09, so the "Rei Q" shorthand is not fanmade at all. Since I have editor privileges, can I make comments on the old FGC episodes? The old commentary threads are still open, so you can post comments in those and let the editors choose the cream of the crop. I intend to (very belatedly) do this myself for episodes 05 and 06 shortly. Hrm. I only see the threads for 05 and 06, and the re-opened 01- the others are nowhere to be seen. If we're doing that, I'm more than willing to take care of it sometime. It occurred to me that this article idea is kind of obvious but I couldn't find an similar article on the site (if anybody can find if one already exists, I'd be more than happy to add to it) but it would be an article on how specifically Evangelion subverts and deconstructs mecha anime tropes. Example: in the ones of I've seen, the main character/audience surrogate in most mecha anime when they see their robot for the first time and are in the position to get inside it for the first time, its a "Its now or never! You need to get in this thing right NOW" situation and the pilot is nervous but pumped (Mazinger Z, Macross, the original Mobile Suit Gundam) but in Evangelion, Shinji is utterly confused and scared by being brought to the GeoFront having not seen his father in years* and suddenly being expected to get in the robot and then being guilted into by having Rei brought out in bandages to pilot it in his place. Other than that, the only thing keeping me from just going ahead and writing the thing is those are the only two concrete examples I can think of. I've only watched a few other mecha anime besides Evangelion so I'm not as well-versed in the tropes of the genre, especially the older ones. Anybody want to help me develop this idea? * I don't want to speak for Gendo but maybe his reasoning was "Oh, like Shinji's never seen the EVA before. He was here when he was little! Granted, he saw Yui become absorbed into it but still... "
You know, I don't think we've ever really thought about having a serious, academic analysis of Evangelion on the wiki before. It's pretty much new territory, and I certainly think it would be a welcome change. 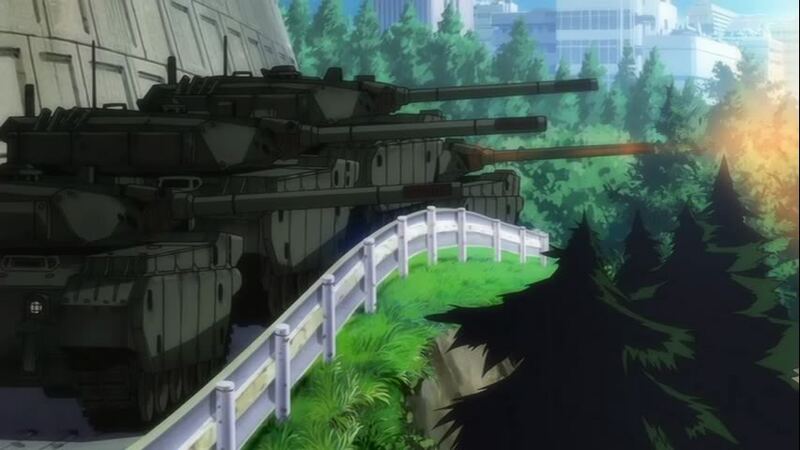 While I'm not much of an expert on mecha anime and mecha tropes, if you mean to turn this into a serious analysis, I'll help as much as I can. For now, I'll let the other contributors weigh in on this before I get back. I think the forums are really the place for that sort of discussion to take place, after which we can then cherry-pick the useful analysis out of it and make a page. This rings a bit of the old Theory and Analysis pages. Well, like I said, I'm pretty new to the genre itself so that's why I thought examining specifically the media tropes Evangelion expands on, subverts or even downright deconstructs was too obvious to bring up. The only thing is my basis of reference is limited in that regard so I couldn't track where a specific trope came from or how many mecha animes deal with it and cite specific examples. I could go obvious and say Shinji as a character is different from most media anime protagonists in the microcosm of just the first episode of seeing the EVA-01 and expressing confusion and fear of piloting it having never been put into a situation like it before when other anime, its a situation where things are happening too quickly and the character steps up to be the hero with almost no qualms about it (maybe I could have fun tracking how many other shows have the robot being passed from father/grandfather to the protagonist, like a patrilineal legacy or something) but going further into the wish fulfilment aspect, like how Kensuke is in total awe of Shinji's responsibility in piloting the EVA when its really just a dangerous duty he has to do or how Toji and Kensuke are envious of Shinji's position living with Misato when he's forever annoyed by her extroverted sloppiness. Would this thread be where I put my ideas or would I have to make another thread and put it somewhere else in the forum? Perhaps the forums are the place for such discussion to happen - and that has indeed been happening ever since Eva Monkey forums were founded a good decade ago. However, the idea of having academic articles on Evangelion on the wiki strikes me as pretty interesting, and like I said, it would be a welcome change. Note that the Theory and Analysis pages deal with in-show material that we have heavily theorized and discussed on the forum - but this looks to be an entirely different idea. mechashiva, are you thinking of a full-blooded academic article, complete with references? Or are you thinking about something more on the lines of a blog entry, a "personal reflection", or an essay? I'd support the former category, but I'm not too sure about the latter. I think I was intending it to be more academic than "personal", as you said. Now it is occurring to me how daunting it would be track through other older mecha anime to draw attention to how Evangelion takes those tropes and expectations to draw you (the hypothetical viewer) into the world and then pull the rug out from under you. I'd be down for seeing a mass of essays on the topic. I assume that we'd have the existing wiki commentary editors acting as proofreaders for QC?